A strange, oblique style permeates this year’s Man Booker Prize-winning novel. 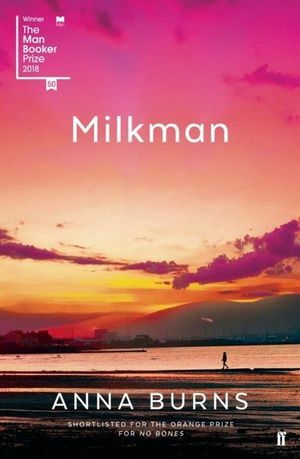 Milkman by Anna Burns is like nothing I’ve ever read before. This frank and concerning statement is your first taste of the brilliant and batty inner voice of Milkman’s narrator. She’s an eighteen-year-old growing up in Northern Ireland during the Troubles. Her family and their neighbourhood, run down and under constant surveillance by the State and by itself, is allied with the republican paramilitaries and exists in an ongoing state of existential and mortal peril. She doesn’t care though. This violent, tribalist world is all she’s known and she really just wants to get on with things. Wouldn’t you? Sectarian and political divisions inform almost every moment of action in Milkman but are only ever referred to in an obtuse shorthand. There is the “right religion” and the “wrong religion.” There are “renouncers” and “defenders” of the State. There is “our side of the road” and “the other side of the road”, there is “over the border” and “over the water.” The acts of butchery committed by both sides of the conflict provides the atmosphere of this novel but it is never directly shown in glorifying, grizzly details. I feel this was a deliberate, and wise choice by the author. Instead Milkman looks to the absurd repressions of tribalism itself – the sectarian purism, the aggrandisement of strongmen and the deft enforcement of patriarchal control – as its true subject matter. In this the digressive voice of the eccentric, unnamed narrator shines in a biting and bizzare satire. Determined to be unremarkable in a place and time where bad things happen to those who stand out, she dissociates with the pious, won’t solidify her status with “Maybe-Boyfriend“ and takes long walks (the buses tended to explode) with her nose deep in 19th Century novels, the 20th Century appearing to be a failed experiment in modernity. Her non attachment and independence has her earmarked by the community as a “beyond-the-pale” and garners the unwanted attention the milkman – an older married man, high in the ranks of the paramilitary. The milkman is an infinitely creepy presence throughout this novel, constantly threatening to appear unannounced flanked by a platoon of thugs, always in full knowledge of everyone’s movements and associations. By his mere presence in her life, and despite her moves to reject him and also despite his never laying a finger on the narrator, the milkman makes her his as far as the hypercritical rabid gossipers of her neighbourhood are concerned. Her own family leap immediately to the conclusion that she’s thrown herself at him, ruining her chances to marry a normal, boring man of her age and religion. The reader is overcome with the powerlessness of this brilliantly voiced narrator in her own story. It’s a story that moves giddily towards the crossroads of absurdity and realism in a bold effort to show us for what we are. There is much more to this town of kooks, killers, and conspirators than meets the eye. Likewise with this novel, it is above and beyond anything I could have expected. Milkman finds itself in good company, I feel, with previous Booker winners Lincoln in the Bardo and The Sellout – each of them strange and defiant marvels. I tried. I struggled to page 267 and gave up. I found the book frustrating, repetitious, too dystopic: no characters are named, no places are named, no motives for anyone’s actions are given. The poison girl and the milkman are lunatics who really warrant no fascination, just anger. I tried reading Ulysses a number of times and maybe I’ll try Milkman again but in the meantime I’ll look for a book to enjoy, not one that is such an ordeal to read.